All boys and girls in kindergarten through eighth grade are eligible to participate. The season will tentatively begin in January. Games will be played on Saturdays and the season will run through March. Registration ends in November. Boys and girls who are 6-9 years old are eligible to participate. These programs will teach the basic fundamentals of baseball and softball in a fun, non-competitive atmosphere. The season will begin in April and will run through June. Games will be played during the week. Registration begins in February. Boys and girls who are 4 and 5 years old by April 30 are eligible to participate. This league is strictly to begin to teach the fundamentals of the game. A soft baseball will be used for safety purposes. Games will be held during the week. A game will consist of one half hour of practice and one half hour of a scrimmage against another team. Registration will begin in February. Girls who are 9-14 years old are eligible to participate in this league. Games will be played during the week and practice will be determined by the coach. The season will begin in April and run through June. Registration begins in February. Boys who are 12 through 15 years old are eligible to participate in this program. The season will begin in June and will run through July. Games will be played on week nights and weekends. Some travel is required in this league. The Recreation Department will be conducting two one-week sessions of Day Camp for boys and girls between the ages of 6 and 12 years old. Camps will be scheduled for the last week of July from 10 a.m. to 3 p.m. Monday through Friday. Campers will enjoy arts and crafts, field trips, swimming and much more. Open to boys and girls of any age, participants must be able to swim 100 yards freestyle unaided to participate in the program. The season begins in May and the teams will compete in weekend tournaments through the month of July. Boys and girls ages 4-13 are eligible to participate. The season will begin tentatively in June and run through August with games being played on weekends. Flag football is available to boys and girls in the first through sixth grade. Volleyball is available to boys and girls in the third through eighth grade. Coaches will teach the fundamentals of football and volleyball, team play and sportsmanship in an organized setting. Games will be held on Tuesdays, Thursdays and Saturdays. The season will start mid-September and runs through November. All sports league registration begins approximately six weeks prior to the start of the season. 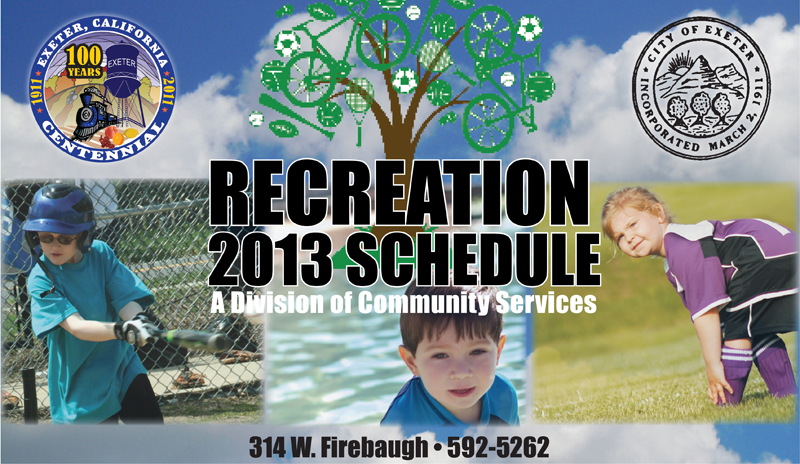 Please call or stop by Community Services offices for registration forms. The Recreation Department with Exeter Union High School Wrestling offers a free-style wrestling program. This program starts in the spring. Ages 6-18 are eligible to participate. The Recreation Department operates the wading pool at City Park from June until August when school starts. It is open Monday, Wednesday, Friday and Saturday from 11 a.m. to 1 p.m. and 2-4 p.m. Ages 7 and younger are permitted. The pool is located on the east side of the park on D Street across from Lincoln Elementary School. * Dates and times are subject to change. The Recreation Department will hold the Annual Easter Egg hunt at the City Park on the Saturday before Easter. This program is free to all children who want to participate. The Recreation Department will hold the Annual Pumpkin Carving Contest during the week of Fall Festival. Children who are 12 years old and younger are eligible to participate. Look for more information in the registration flyer. The Recreation Department will hold the Annual Lip Sync Contest during the week of Fall Festival. Children who are in kindergarten through high school are encouraged to participate. Categories are as follows: Male Soloist, Female Soloist, and Group. Look for more information details in the registration flyer. For more information, call Linda Wachter at 559-592-5262 or send e-mail to lwachter@exetercityhall.com. FAX is 592-5072. Exeter Community Services is located at 314 W. Firebaugh Ave. The Community Services Department holds the Exeter Christmas Parade on the first Friday of each December. The parade will travel down Pine Street through downtown Exeter. Everyone is encouraged to participate in this free event. First and second place trophies are awarded in each category. For more information, call Amy Carter at 592-5262 or send e-mail to acarter@exetercityhall.com. FAX is 592-5072. The Exeter Parks & Recreation Office is located at 314 W. Firebaugh Ave.
Men ages 18-and-older are eligible to participate. The season will start in the middle of July and run through the middle of September. All games will be played on week nights at Dobson Field. Men and women 18-and-older are eligible to participate. The season will begin in the second week of May and will run through the middle of June. All games will be played on week nights at Lincoln School. Men ages 18-and-older are eligible. The season will begin sometime in March. Games will be played on Tuesdays, Wednesdays, Thursdays and Sundays. The season will run through May. The Recreation Department will hold two 10K and 2 Mile Run/Walk events. The first will be held during the Fourth of July celebration and the second will be held during the Fall Festival celebration in October. The first 100 entrants receive T-shirts at Fourth of July and the first 50 receive T-shirts at Fall Festival. Awards are given to the top three finishers in each age division for the 10K and top 10 predictions for the 2 Mile Run/Walk. The race will start and finish at City Park. The Recreation Department holds two Horseshoe Tournaments every year at City Park. The first is on Fourth of July and the second is during Fall Festival. The tournament is a round robin style. Placement is determined by average percent of ringers on record. -SOURCE: The Foothills Sun-Gazette Newspaper would like to thank the City of Exeter Community Services, Recreation Department for providing this information.